This research was carried out to determine Microcrustacea (Cladocera, Copepoda) fauna and their seasonal distribution in Tunca River which is one of the important transboundary streams in Turkey. For this purpose, Cladocera and Copepoda samples were collected from June 2014 to May 2015 in four stations from Tunca River, and some environmental parameters were also measured. A total of 21 species, 8 from Copepoda and 13 from Cladocera, were determined in the qualitative evaluation of the Microcrustacea samples taken from the river. The quantitative evaluation of the samples showed that 203 ind./m³ zooplankton in average was found in Tunca River. The identification of these organisms revealed that Cladocera and Copepoda were represented with 85 ind./m³ (42 %) and 118 ind./m³ (58 %), respectively. Acanthocyclops robustus (G.O.Sars, 1863) (18.1 ind./m³) and Cyclops vicinus Uljanin, 1875 (11.4 indi./m³) from Copepoda and Daphnia pulex Leydig, 1860 (20 ind./m³), Chydorus sphaericus (O.F.Müller; 1776) (18.1 ind./m³), Daphnia cucullata Sars, 1862 (15,5 ind./m³) and Bosmina longirostris (O.F.Müller, 1785) (14.5 ind./m³) from Cladocera were found to be the most common species. According to the Turkish Surface Water Quality Management Regulations, Tunca River was classified as Class 1 and Class 2. However, the phosphate values were classified as class 3 and 4. Bu araştırma Meriç Nehri’nin bir kolu olan ve sınır aşan önemli akarsularımızdan Tunca Nehri’nin Microcrustacea (Cladocera, Copepoda) faunasını ve mevsimsel dağılımını belirlemek amacıyla yapılmıştır. Bu amaçla Tunca Nehri’nde belirlenen 4 istasyondan Haziran 2014-Mayıs 2015 tarihleri arasında Cladocera ve Copepoda örnekleri toplanmış bu organizmaları etkileyen bazı çevresel parametreler de ölçülmüştür. Toplanan örneklerin değerlendirilmesi sonucunda Cladocera’da 13, Copepoda’da 8 tür tespit edilirken Tunca Nehri’nde yıllık ortalama 203 birey/m3 Microcrustacea bulunmuştur. Bu organizmalardan 85 birey/m3 Cladocera (% 42) ve 118 birey/m3 Copepoda (% 58) grubuna aittir. En yaygın türler olarak Copepoda’da Acanthocyclops robustus (G.O.Sars, 1863) 18,1 birey/m3 ve Cyclops vicinus Uljanin, 1875 11,4 birey/m3; Cladocera’da ise Daphnia pulex Leydig, 1860 (20 birey/m3), Chydorus sphaericus (O.F.Müller; 1776) (18,1 birey/m3), Daphnia cucullata Sars, 1862 (15,5 birey/m3) ve Bosmina longirostris (O.F.Müller, 1785) (14,5 birey/m3) bulunmuştur. Tunca Nehri’nin ölçülen çevresel değişkenlerin aylara göre değişimi Yüzeysel Su Kalitesi Yönetmeliği’ne göre değerlendirilmiş ve nehir suyunun aylara göre I. ila II. sınıf su kalitesi arasında değiştiği, sadece fosfat değerleri açısında III. ila IV. sınıf su kalitesi arasında olduğu tespit edilmiştir. Altındağ A, Buyurgan Ö, Kaya M, Özdemir E, Dirican S. 2009. 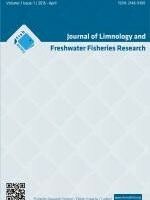 A survey on some physico chemical parameters and zooplankton structure in Karaman stream, Antalya, Turkey. J Anim Vet Adv. 8(9): 1710-1716. Altınoluk P, Çamur-Elipek B, Aydoğdu H. 2014. Vertical dynamics of some indicator microorganisms in Tunca river at Turkish Thrace. Macedonian J Ecol and Enviro. 16(1-2): 5-9. Apostolov AM, Marinov TM. 1988. Fauna Bulcarica 18, Copepoda, Harpacticoida. In Aedibus Academiae Scientiarum Bulcaricae, Sofia. 18: 384p. Balık S, Ustaoğlu MR, Sarı HM. 1999. Kuzey Ege Bölgesi’ndeki akarsuların faunası üzerine ilk gözlemler. Ege Üni Su Ürün Derg. 16(3-4): 289-299. Baysal N, Saler S. 2014. Çalgan deresi (Elazığ) zooplanktonu. Fırat Üni Fen Bil Derg. 26(1): 1-7. Bozkurt A. 2004. Doğu Akdeniz Bölgesindeki bazi baraj ve göletlerin zooplankton faunası üzerine ilk gözlemler. Türk Sucul Yaşam Derg. 2(3): 71-76. Bulut H, Saler S. 2014. Zooplankton variation of Murat river (Elazığ-within the borders Palu district). Turk J Agrie-Food Sci Tech. 2(1):13-17. Dorak Z. 2013. Zooplankton abundance in the lower Sakarya river basin (Turkey): Impact of environmental variables. J Black Sea/Mediterranean Environ. 19 (1): 1-22. Dussart B. 1967. Les Copepodes des eaux continentales d’Europe occidentale, Tome I, Calanoides et Harpacticoides. N. Boubee et cie, Paris, 500p. Dussart B. 1969. Les Copepodes des eaux continentales d’Europe occidentale, Tale II. Cyclopoides et Biologie. N. Boubee et cie. Paris, 292p. Flössner D. 1972. Krebstiere Crustacea kiemen und blattfussar Brachiopoda fischlause, Branchiura. Tierwelt-Deusch 60 Veb Gustav Fischer Verlag, Jena, 105-161. Gannon JE, Stemberger RS. 1978. Zooplankton especially crustaceans and rotifers as indicators of water quality. Trans Am Micros Soc. 97, 16-35. Goulden CE, Fery DG. 1963. The Occurence and significance of lateral head pores in the genus Bosmina (Cladocera). Int Rev Ges Hydrobiol. 48(3): 513-522. Göksu MZL, Bozkurt B, Taşdemir M, Sarıhan E. 2005. Asi nehri (Hatay, Türkiye) Cladocera ve Copepoda (Crustacea) faunası. Ege J Fish Aquat Sci. 22(1-2): 17–19. Guy D. 1992. The ecology of the fish pond ecosystem with special reference to Africa. Pergamon press, 220-230. Güher H, Kırgız T. 1992. Edirne bölgesi Cladocera (Crustacea) türleri. XI. Ulusal Biyoloji Kongresi, Hidrobiyoloji Seksiyonu, Elazığ, Türkiye, 89-97. Kaya M, Altındağ A. 2006. Some Chydorid (Crustacea, Cladocera) species recorded from Turkish inland waters. Sakarya Üni Fen Ede Derg. 8:33-48. Kiefer F. 1978. Das Zooplankton der Binnengewasser, 2. Teil Stuttgart, 343pp. Korinek V. 1987. Revision of three species of the genus Diaphanosoma Ficher 1850. Hidrobiol. 145, 35-45. Krebs CJ. 1999. Ecological methodology. Addison Wesley Longman, Inc Menlo Park, California. 620 pp. Makarewicz JC. 1993. A lake wide comparison of zooplankton biomass and its species composition in Lake Erie. J Great Lakes Res. 19(2): 275-290. Margaritora F. 1983. Cladocera (Crustacea: Cladocera). Inst di zoologia dell Univ. Roma, 169 pp. Özdemir Y, Şen D. 1994. Haringet çayında saptanan zooplankter organizmalar. Fırat Üniv Fen ve Müh Bil Derg. 6(2): 136-140. Ryding SO, Rast W. 1989. The control of eutrophication of lakes and reservoirs. Man and the Biosphere Series, Vol. 1. Unesco, Paris and The Parthenon Publishing Group, UK & USA. 314 pp. Saler S, Bulut H, Birici N, Tepe R, Alpaslan K. 2015. Karasu nehri (Erzincan)'nin zooplanktonu. Eğirdir Su Ürün Fak Derg. 11(1):10-16. Saler S, Eroğlu M, Haykır H. 2011a. Peri Çayı (Tunceli-Türkiye) zooplanktonu. e-Journal of New World Sciences Academy, Ecol Sci. 6(2): 14-20. Sharma S, Siddique A, Singh K, Chouhan M, Vyas A, Solnki CM, Sharma D, Nair S, Sengupta T. 2010. Population dynamics and seasonal abundance of zooplankton community in Narmada river (India). Researcher 2(9): 1-9. Smirnov NN. 1974. Fauna of USSR. Crustacea, Chydoridae, 1(2): 629 pp. Trivedi RK, Guruna V, Das BK, Rout SK. 2003. Variations of plankton population of two hill streams of the Darjeeling District, West Bengal. Enviro and Ecol, 21:50-53.